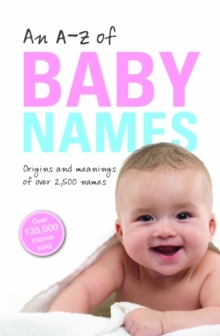 Previously Babies' Names and now reissued as An A-Z of Baby Names with new covers and essential updates, this bestselling A to Z will help you find the perfect name for your baby. The book lists over 2,500 names in common use in the English-speaking world with information on their meanings and origins. It spans traditional names, from Anne and Albert to Victoria and William, to modern names, from Azalea and Bryn to Brooklyn and Zanna and every name in between. Also included in this edition is an article on how to find the right name or create your own, as well as additional material within entries on well-known bearers of the name, real and fictional. In addition to theA-Z list of names there is an appendix including thematic indexes for many names categories such as Biblical names, names from television and films, names from literature and popular culture, pet forms and nicknames, as well as a list of the most popular names by year and by region. An A-Z of Baby Names has all the information parents-to-be need to make the all-important choice of naming their baby.